People say that a picture is worth a thousand words. As a musician, I have always believed in the power of the art to bring back memories of the past, be them good or bad. Similar to music, a photo is a powerful medium that can bring us back to the past so that we can experience the exact split second that is framed in that photo once again. Whether it be the memory of the scent of the mountain breeze, the sound of two late-aged men yodelling in a cable car, the taste of fresh milk that you literally milked from the cow on your own, or the texture of the rocks by the beach, a photo stores so many memories. It's amazing how a visual imagery can bring us to an entirely different world in a split second. Surely you may have noticed that I have not posted anything on this blog for - well - almost 10 months. There has been plenty of ups and downs these past few months and I went completely out of inspiration to write on this blog. For once, I did not find joy in something that usually makes me happy and excited. But now, I'm ready to get back once again and find joy in it. BUT OF COURSE I didn't forget to regularly post on my Instagram (@adrieltjokro). It is, after all, my mini blog; one that I can update easily on the go as it goes live with my adventure around the world. It's unfortunate that in the past 10 months or so I didn't have plenty of #OneThemeParkAtATime moments to add into my adventure. Regardless, I remain grateful for the adventurous and lovely seconds that I spent again and again. With that being said, here I present to you the top 10 scenery-based photos from my Instagram; the ones that people - my followers, the strangers, and the discoverers - seem to really love as much as I do. Here are the stories that I want to tell you. Not in the top 10, but might as well put it since it was a close call. The day was chilly but not too cold; warm but not too hot; breezy but not too windy. It was a perfect day. The crowd was relatively manageable compared to that of a Disney park. I was towards the end of my first-ever backpacking trip when I finally visited the theme park that I had always wanted to go to: Europa-Park. After an intensive morning going back and forth between one roller coaster/thrill ride and another, I finally had the chance to slow down and enjoy my surroundings. 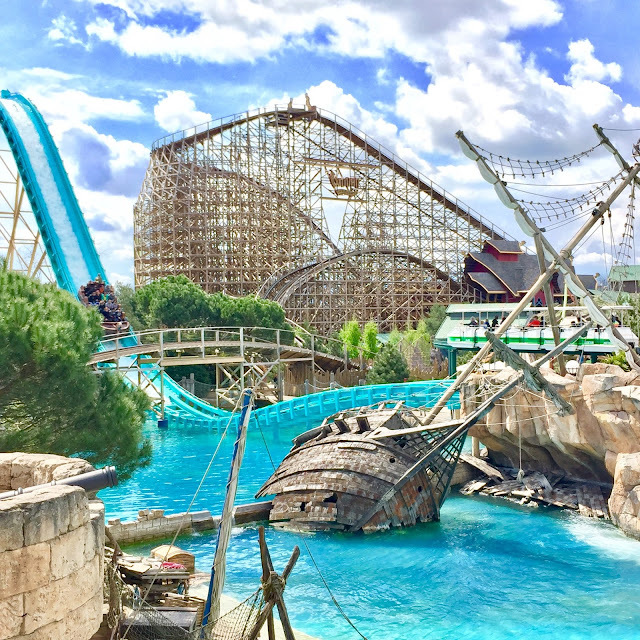 As I looked back, I saw this: the magnificent boat of Atlantica SuperSplash about to merge its riders in deep water as the first hill of Wodan Timburcoaster soars in the background. I thought the shades of blue, green, and brown really captured my eyes. That day, I added 13 roller coasters into my coaster count. Everything was well. I was really happy. Rainbows never cease to amaze me: the shades of colours in the sky make even my gloomiest, darkest mood light up with glimmers of hope and sparks of joy. This picture was taken after a long, stormy day; a day with one of the largest, scariest thunderstorms I had ever gone through in Singapore. It was a day when literally no one went out because not even the mightiest umbrellas and raincoats can keep you dry (and of course because the UBER fee just skyrocketed up by 5-fold). As the rain slowed down and the sun started shining again, the rainbow appeared. Together with the skyline of the Central Business District (CBD) of Singapore in the background, I thought it was such a fitting scenery to capture and remember. 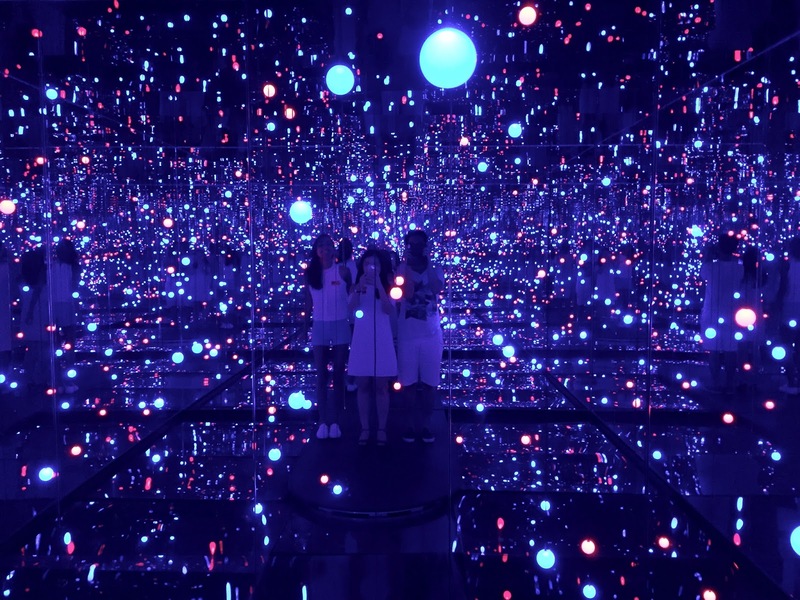 When the news came that the world-renowned Yayoi Kusama is having her travelling exhibition stopping by Singapore's own National Gallery, Singaporeans went gaga! At the time, though, I was still one month into my new job in Singapore and unfortunately it required plenty of weekend work, rendering it impossible for me to actually go attend the exhibition. One amazing weekend in October, though, just a couple of days before the exhibition was closed off, a friend messaged me, "Hey, we're going to Yayoi Kusama's exhibition today. Do you wanna come?" and the rest was history. This particular section especially enchanted me because of the infinite starry, dreamy feel that I got from it. The only downside is that we were given only 20 seconds to enjoy this piece of art, so instead of enjoying it, we were trying to get as many photos as we can. On my recent trip to France, I stopped by Nice at the most unfortunate weekend. Weather forecast suggested it was going to be cloudy and rainy from Friday to Sunday. I was pretty bummed because people have been saying of how nice Nice is (of course, Nice is nice) when the sun is glimmering on the seemingly crystal-clear beach. February 17th was a Saturday and - true to the weather forecast - is started to rain like crazy throughout the city. Not knowing what to do in the rain, I decided to book the only seat left in the Nice Carnival that night. The carnival ended up being a highlight of my trip: a celebration of freaks, foolishness, and plain - sometimes borderline stupid - fun. 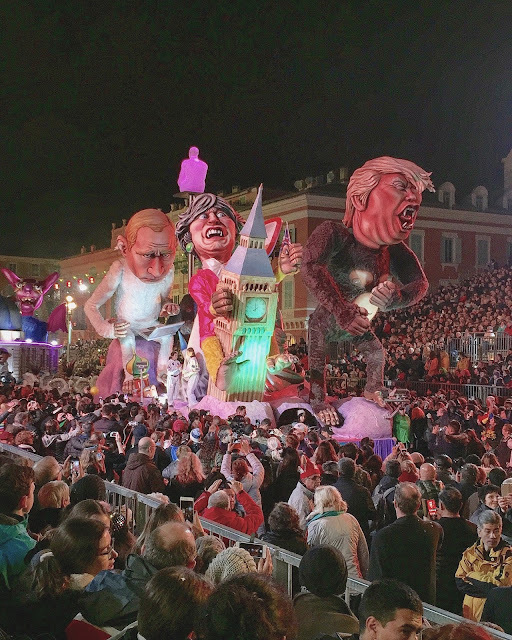 The crowd was wild, the performers were energetic, and the floats were wonderful and colourful. Then this one float passed by and everyone's eyes gazed upon this bombastic representation of our "great" leaders of the world. I'll leave it up to you guys to know who these guys are. It was January 2017. I was entering my second month working on my Master's thesis for Fudan University at Shanghai Disneyland. Following a relatively quiet 6-month grand opening period, the theme park started to receive massive influx of guests as the humongous Chinese New Year holiday approached. January 14th, 2017 was a particularly windy and busy day for the park with some rides gaining wait times north of 180 minutes. At noon exactly, just like every other day, there was this parade that goes throughout the park's main pathway. Cast members sprawled everywhere to keep the path clear of crowd, adults were excited to have their favourite characters passing by, and children were crying for no odd reasons. At one point, as I was heading for lunch outside the park, I looked back and saw this one Cast Member struggling to contain the many balloons he was holding from flying away. I quickly snatched my phone and snapped this photo. The outcome was magical. Adapting to your first job is crazy and turned out I was no exception. My first job in Singapore was crazy and I dedicated much of my time into my work 7 days a week - and at times 24 hours a day. Constantly being attached to your phones can indeed make you crazy and robotic. When a friend of mine from the Master's program that I did visited Singapore, I left work for the entire weekend and brought him - along with another Singapore-based buddy - around Singapore. We visited and revisited many places that I had always wanted to go to. 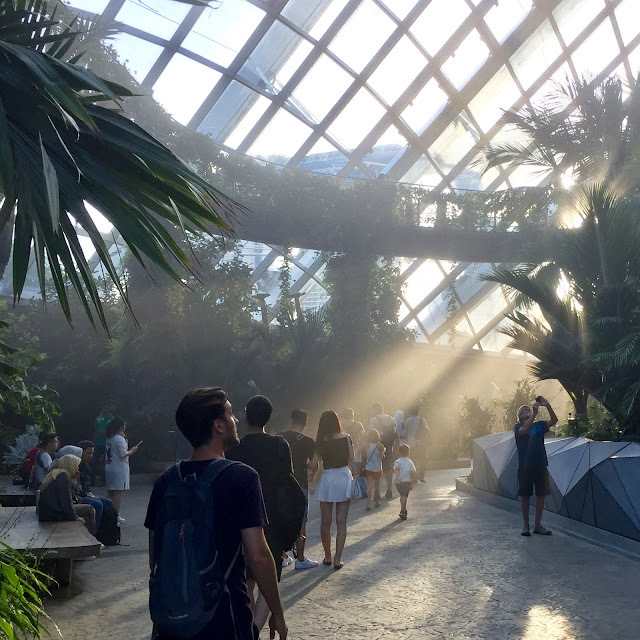 One of those places is the Cloud Forest greenhouse at the Gardens by the Bay, which we visited right before sunset. As we entered the controlled-climate space, the sun was setting and the sunlight was without doubt magical. We were walking our way to the top of the dome when this caught my eyes: my friend looking directly into the ray of light. To me, it was like an image of hope and enchantment. Amongst the many trips that I took while I was studying and writing my thesis in Shanghai, China, I did so with my friends that I studied with. 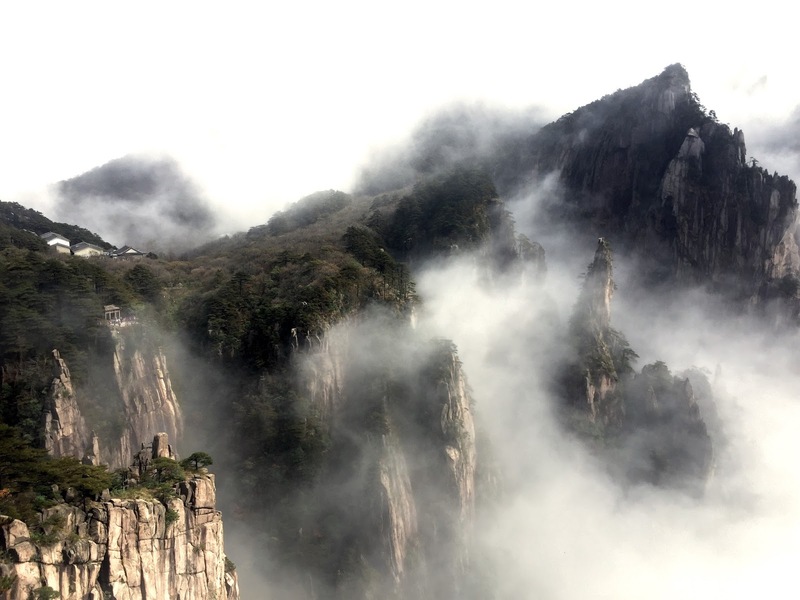 One of those trips was a hiking trip that we did for an entire weekend in Huangshan, which is famous for its picturesque natural landscapes and mystical vibe. To our dismay, after more than 6 hours of train ride, we arrived to massive downpour and chilly climate at the top of the mountain. We were worried that the trip would end up being a massive disappointment, but we slept our thoughts off anyways. The next day, undeterred by the unfavourable weather forecast, we started our ascent through the sprawling treks of the mountain. We kept going up, and up, and up... and all of a sudden the mist gave way, the sun came out, and the mountain revealed itself. There, behind and beneath the fog, was the sight that we came all the way from Shanghai for. I was lucky to capture this shot as seconds later the fog came back again and the mountain was covered once again, never to be seen for the next couple of hours. When I flew to Los Angeles in April 2017, it was the first time I visited the city in more than 10 years. Between that and my most recent visit, I had always heard of how difficult it is to explore and navigate around the city without cars. Yet, I purchased my Metro Pass and started going around with the metro and the buses. Before I knew it, I was in Downtown L.A., one hell of an area that I was surprised that not many people really talk of. True, L.A. might have better things to offer, from the pleasant Santa Monica to that really fun theme parks in the Anaheim area, just one hour south of L.A.. But I found Downtown L.A. - despite being less lively compared to other downtowns I had gone to - enchanting and unique in its own way. As I look up at Pershing Square, I saw Deloitte, which reminded me of a friend at London Business School who used to work there. I snatched this picture and sent it to him and said, "Look, I'm in L.A. and I'm visiting your company!" Actually not really. There is something about river that calms and soothes me. Perhaps it's the gentle ripple of the river flow, the calming scent of the soil and the water, or I'm just weird that way. Bern, Switzerland was the last stop of my first-ever backpacking trip around Europe, which ended up lasting for 31 days. 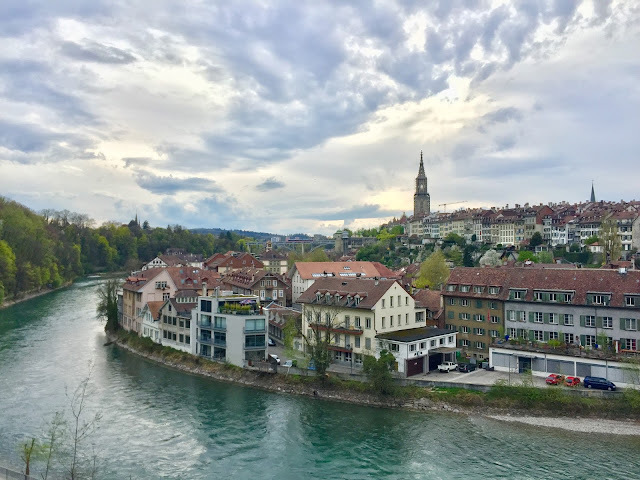 Certainly being in Bern at the end of my trip was not easy: I had limited amount of money left and unfortunately Bern is definitely not a cheap city, so I was trying to save as much money as I could without spoiling my experience. Unlike other cities that I visited in the trip, Bern is different. The city, in itself, is an attraction on its own. It never stopped to make my jaw drop with its vibe and beautiful buildings and antiques. All I knew that day was that I walked, I walked, and all of a sudden I was at the top of a hill overlooking the city and the river that surrounds it. After a fast-paced, city-hopping, non-stop backpacking, I came to realise that it was finally coming to an end. In the distance, the bells rang. It was 5:15pm. On April 16th, 2016 at exactly 5:15pm, after almost a month of hustling and buzzing, I finally got the chance to sit still, calm down, and witness the magical moment that was just around the river bend. This is my second photo of Gardens by the Bay that is really well-loved and it deserves so. 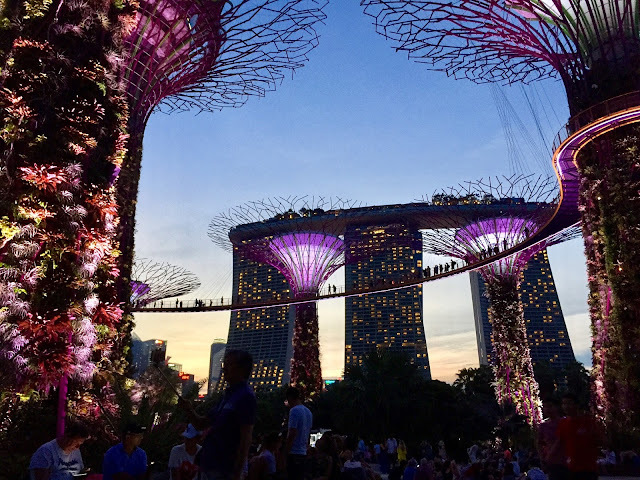 While Gardens by the Bay is only a few bus stops away from where I lived and worked, I never had the chance to experience its true magic until that one evening. I was waiting for the 7:30pm Garden Rhapsody light show to start and - behold - this sight came at the most convenient time possible. Afterwards, I sat back, relaxed, and laid down on the pavement as I continued to be in awe of the sight of Marina Bay Sands in the twilight. If you feel that this view is eerily familiar, say no more. That year, the movie La La Land was all the hype with its accolades and magical representation of Los Angeles. 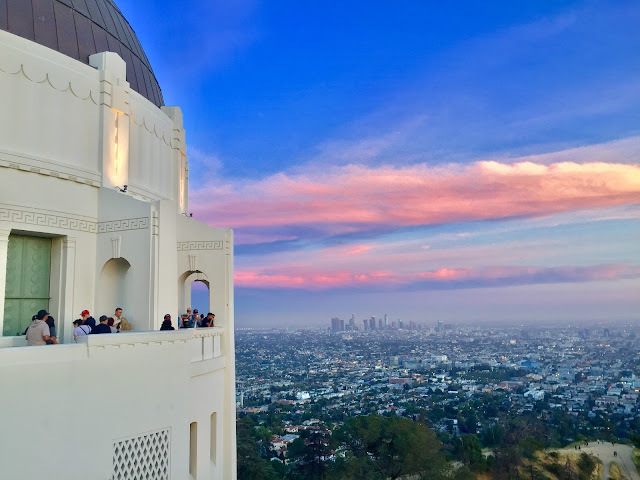 At one part, the movie takes the audience to the Griffith Observatory just right after sunset, and one of the shot gives this beautiful shot of Los Angeles from the site. So while I was in town, I climbed up the hill to search for that exact spot... and I found it. There, just right before sunset, the sky showed its hues of blues, purples, and pink, with the massive city sprawling down underneath and the skyscrapers looming in the background. I came at the right moment, I shot it, and I smiled. Then I saturated the hell out of everything and - voilà! - I got the crazy colours. Great to see a post from you after such a long time, Adriel :) Wonderful stories!